A PC gaming legend expresses his concern over the future of consoles. If there's one thing you can say about Id Software co-founder John Carmack, it's that when he chooses to weigh in on a topic, he rarely holds back. In a recent Twitter exchange, the well-known programmer stands by his claim that future consoles will be capable of running most titles at just 30fps. A well-established name in the PC gaming scene, Carmack has been largely critical of console gaming for quite a while. But given that both Sony and Microsoft have remained completely tight-lipped on what their next hardware release will be, any opinion of what next-gen consoles will be capable of is based largely on rumored specs and other details that may have no basis in reality. With Id's release of Rage for both PC and home consoles, Carmack appeared to have mixed feelings. He is quoted as saying that the FPS title was designed for consoles, but noted the difficulty of fitting all of the game's content onto the storage mediums of the Xbox 360 and PS3. He later expressed regret in his decision to focus on consoles from the start, noting how negatively his choice affected the product on PC. It remains unclear whether Carmack's stance on next-gen consoles stems from disappointment in the rumored hardware specs or a belief that developers simply won't push the consoles to their respective limits. 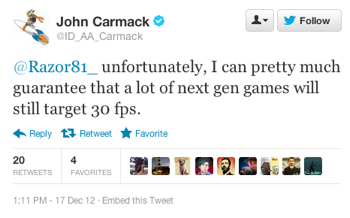 Either way, it appears that Carmack is siding with the PC, at least for the time being.